Our boat carpet is 6 ft wide and 100% UV stabilized Rubber Backed Marine Carpet. - This Carpet is made for Boat/Marine Use. This carpet is made for GLUE DOWN APPLICATION. It will not work for snap in unless you reinforce the back of the snap. For best results, apply to a clean cool surface, out of the sun, at ambient temperature. Spray F11® onto the surface you want to enhance, coat, & protect. Spread F11®, while hand buffing F11®, into the surface using a clean micro-fiber towel, flipping to a dry portion of the micro-fiber towel often during buffing. 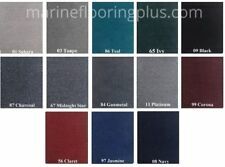 Our boat carpet is 8.5' ft wide and 100% UV stabilized Rubber Backed Marine Carpet. This carpet is made for GLUE DOWN APPLICATION. It will not work for snap in unless you reinforce the back of the snap. 20 Oz Cut-Pile Marine Outdoor BASS Boat Carpet- 8.5' x 15' - You Choose Color! This is for a piece cut as 8.5' x 15' Bass Boat Carpet. Our boat carpet is 8.5' ft wide and 100% UV stabilized Rubber Backed Marine Carpet.This carpet is made for GLUE DOWN APPLICATION. It will not work for snap in unless you reinforce the back of the snap. Plug-n-play with PowerDrive V2, PowerDrive and Riptide PowerDrive trolling motors. Boss Audio MGR350B 3" Gauge Bluetooth and MP3 Marine Receiver. Video of MGR350B Item Code: MGR350B. Weather Proof 60 Watts x 4 Max Power, RDS Tuner, Balance/Fader/Bass/Treble and Preset built-in EQ. CEA Compliant Ratings! 1000w Peak/250w RMS Crazy Loud!! It is less plush. It has less, and shorter fibers than our deluxe 20 Oz boat carpet. It is priced per FT. Important Notice . Resistant to Mold & Mildew. How does this vary from our Deluxe 20 Oz Cut Pile?. Extreme Max 3005.3852 Straight Transom Saver - 21" to 31"
Trailering puts a strain on your transom. simple physics says its not good for your boat. This straight transom saver mounts over your trailers rear roller, and extends from 21" to 31". It distributes the weight of your motor and power trim to the rest of your boat, eliminating strain on your transom and protecting your boat. 5 out of 5 stars - Extreme Max 3005.3852 Straight Transom Saver - 21" to 31"
3 product ratings3 product ratings - Extreme Max 3005.3852 Straight Transom Saver - 21" to 31"
Luminous flux: 6000LM. 1 x Searchlight. Light type: Spotlight 30° Floodlight 60°. shell material is alloy material, easy to install, waterproof and shockproof are very good. Your satis faction is our ultimate goal. The decals go on the outside of any SMOOTH, clean, outer boat or jet ski surface. 2 Color vinyl decal set (2) Decals are 3" x 18". Fits all boats and jet skis. 5-7 year high quality - high gloss marine vinyl. ◎ HIGH QUALITY: IP67 waterproof, DC 12V operated, and is designed to last 50,000 hours. ◎ SUPER BRIGHT: With 9Pcs imported 5050 led chip, can produce a very visible light of 2 miles, best. to put it in any where you want. G1B | 3” BOAT | JETSKI REGISTRATION NUMBERS CUSTOM DECAL PAIR W/BACKGROUND! In the font and colors of your choice. Decal Total Size is 3” Tall x 18”-20” Long. This is the reason for the variable lengths of our decals, in order for us to make sure the font is 3” tall, it will cause the length of the entire decal to differentiate. 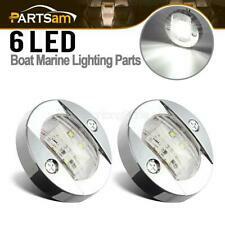 Type Boat Transom Light. 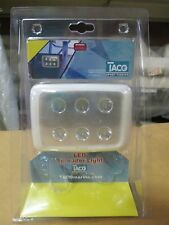 1 x Boat Transom Light. Material Stainless Steel 316. Housing Color Polished Stainless Steel. LED lights don't get hot and have a very efficient power draw. LED Color Blue. Great for PWC or Boat trailer bunks, interior and exterior projects. It is designed for many years of use as trailer bunk carpet. This material n ot rot, fuzz, zipper or unravel. The carpet is easy to cut. CEA Compliant Ratings! 800w Peak/200w RMS Crazy Loud!!! 1X 5M RGB Waterproof Flexible LED Strip light 5050 300SMD 24 Key Remote DC 12V. The 5050 SMD LED Strip is. LED type:SMD 5050. Color:RGB（Red Green Blue mixup）. 6.120-degree wide angle illumination makes your world super bright and beautiful. 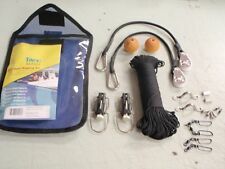 The ConnectPro (Marinco) trolling motor plug and receptacle is a revolutionary concept in trolling motor DC connections. The ConnectPro system has superior electric current carrying capacity that eliminates problems that rob motors of power and reduce battery life. Trending at $38.97eBay determines this price through a machine learned model of the product's sale prices within the last 90 days. Letters will be printed with high performance Oracal 651 outdoor rated waterproof adhesive backed vinyl. Letters will be separated from the numbers: Example:WS 1234 AB. WE ARE A MARINE SALES AND SERVICE FACILITY. WHITE MARINE-TEX 2 OUNCE KIT. ALL AROUND MARINE REPAIR. Local Seller!!! Fast Shipping!!! 364+Sold!!! Make trolling easy with the Trophy Strike Transom Mount Trolling Motor. This 12-volt, 8-speed trolling motor is built with the ultimate durability in mind. Designed with a 36” shaft length made from special anti-corrosive composite, it features a 3-blade, all-aluminum head propeller with marine paint, and an LED battery power indicator. No Tools required. Easy to use. For use on all lower units with side water inlets.